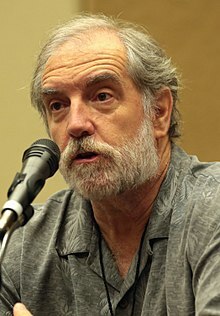 John Patrick Lowrie (born June 28, 1952 in Honolulu, Hawaii) is an American voice actor, actor, musician and author best known for voicing the Sniper in Team Fortress 2 and various characters in Dota 2. He has played Sherlock Holmes on the radio dramas The Classic Adventures of Sherlock Holmes and The Further Adventures of Sherlock Holmes (Imagination Theater, Jim French Productions) longer than any other actor in history, including Basil Rathbone. Lowrie has performed roles in video games such as The Suffering and The Suffering: Ties That Bind, Total Annihilation and its expansions, The Operative: No One Lives Forever and No One Lives Forever 2: A Spy in H.A.R.M. 's Way. Lowrie is mostly recognized for his voice acting in Valve games such asTeam Fortress 2, Half-Life 2, Half-Life 2: Episode One, Half-Life 2: Episode Two, Left 4 Dead and Dota 2. He is noted for playing the roles of The Sniper in the online FPS Team Fortress 2, Agent Gray in the MMORPG The Matrix Online, as well as Odessa Cubbage and the male citizens in Half-Life 2. Lowrie plays Sherlock Holmes in The Further Adventures of Sherlock Holmes, a radio show produced by Jim French Productions. In 2011, he published a science fiction novel named Dancing with Eternity. His adolescence was spent in Boulder, Colorado where he attended various high schools briefly before joining the United States Navy. He studied for a Ph.D. in Music Composition at Indiana University. He has been married to Ellen McLain since 1986. McLain also works as a voice actress, and has starred alongside him in Half-Life 2, Team Fortress 2, and Dota 2. ^ "Podcast Episode 41". Impetuous Windmills. 2011-02-14. Retrieved 2011-07-19. ^ "Dancing With Eternity by John Patrick Lowrie". Goodreads. September 1, 2011. Retrieved May 28, 2017. ^ McLain, Ellen (September 20, 2016). "Complete Classic Adventures of Sherlock Holmes". ellenmclain.net. Retrieved 2017-05-28. Ellen is on several of the episodes, her husband John Patrick Lowrie – Actor/Writer – Voice Actor in 20+ video games plays Sherlock. ^ Gross, Ashley (May 8, 2015). "The Unlikely Stars Of Americans' Favorite Video Games". National Public Radio. Retrieved May 26, 2017. This page was last edited on 2 January 2019, at 20:17 (UTC).